This is a modern container for two Leica bodies and up to five lenses and is made of water- and dirt-repellent canvas. The spacious zippered front pocket provides ample room for film, a small notebook and pen, filters, a small handheld meter or up to 3 lenses! Both compartments feature removable and repositionable dividers to tailor the bag to your needs. 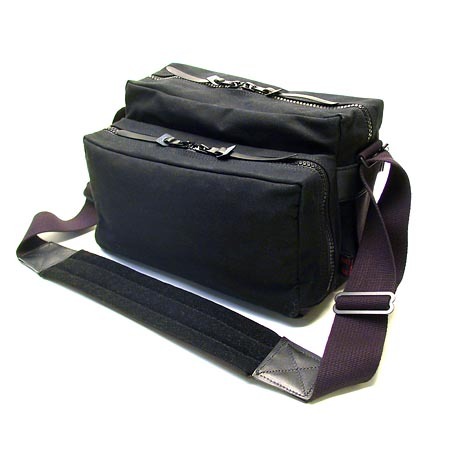 This bag is even versatile enough to carry a small SLR kit and extra lens with no trouble. The heavyweight canvas strap is practically overkill for this small, lightweight bag and ensures that no matter the conditions, you won't have to worry. And the long, wide leather and canvas shoulder pad features a rough, no-slip side to grip the bag to your body. The strap is even long enough to wear this bag "sling-style!"